Joan Rivers’ beloved line of merchandise on QVC won’t end with her death. The late comedian’s cohort on her Joan Rivers Classics Collection, David Dangle, posted a blog on QVC.com saying that the show will go on, so to speak. And Rivers’ daughter Melissa says in a letter to QVC shoppers that this is what her mom would have wanted. During her 24-year tenure at QVC, Rivers sold $1 billion worth of merchandise, according to Fortune magazine. Melissa said the same in her missive to QVC shoppers. I cannot express my thanks to you for all the support you have shown Cooper and me during the last few weeks. Your love and courage are helping me through this difficult time. If you can, please take the opportunity to express to our loyal fans how much their support has meant. Knowing that so many people enjoy my mother’s products is a true testament to the love she put behind every single item. For the last 24 years, you have been side by side with her on this journey with QVC. It is so important to me that we continue to share with others her passion for design. My mother always felt that her business and the people who worked with her were a family. We have all spent so many of life’s important moments together, that I cannot imagine moving forward without all of you. She would want us to continue and I know it’s the right way to honor her legacy. I know that on a personal level, you are grieving the loss of a dear friend. 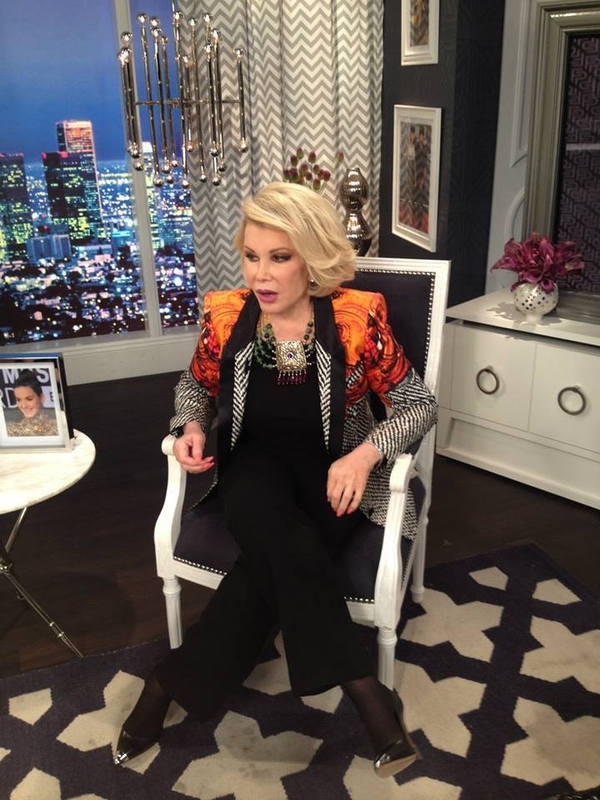 She loved you beyond words and was so proud to have you in her life, as am I.
QVC will air a two-hour special on Oct. 13 “to celebrate Joan and continue her legacy of great style and lots of laughter,” Dangle said. Jewelry Television host Erin Moseley, whose hubby is also a host on the all-jewelry-all-the-time network, is exiting the joint. Moseley, a perky blonde, posted the news on her Facebook page. She urged folks to connect with her on her page. Moseley’s husband Jeff, who is still a JTV employee, put in a good word for his spouse. “Hope a successful network picks her up now that she is a FREE agent…she is amazing!” he said. It looks like former HSN vendor-celebrity restaurateur Todd English may finally be seeing the light. English, whose intoxicated antics have included practically having a three-some in a Manhattan eatery, “is focusing on charity,” according to the Post. Is this a PR ploy? To us, it could be. English appeared at a Food Bank fundraiser at Henri Bendel earlier this week, and has some other good works in the works, including one for Breast Cancer Awareness Month. Best-selling cookbook author Ina Garten is coming to QVC Sunday to hawk her newest tome, “Make It Ahead,” on “In the Kitchen with David,” the network said Wednesday. Viewers will have the opportunity to order Garten’s new cookbook more than four weeks in advance of its release date. Garten’s “Make It Ahead” features 88 recipes such as Wild Mushroom and Farro Soup, Braised Red Cabbage with Pancetta, and Leek and Ham Empanadas. HSN has received a U.S. patent, No. 8,768,781 to be precise, regarding certain aspects of its HSN2 platform, the home shopping network said Tuesday. The new patent for HSN2, a spinoff of the mother ship HSN, “highlights the forward-thinking culture at HSN and reinforces the company’s position as the industry leader in transactional innovation,” the press release. That’s a bit of horn-tooting on the part of HSN, isn’t it? We guess that’s because this is its sixth patent. U.S. Patent No. 8,768,781, entitled “Method and System for Improved E-Commerce Shopping” covers many of the proprietary features of HSN’s “HSN2” platform and is directed to a system and method that provides updated product information to consumers. The claimed system and method provide the automated transmission of updated, time-sensitive information relating to a product, offering consumers the most up-to-date information about the various products offered on HSN2. “This additional patent is yet another in a series of patents and applications directed to HSN’s unique retail shopping platforms which support the company’s boundaryless retail experiences,” the network said. Additional United States and international patent applications have been filed directed to various applications and uses of HSN’s proprietary technologies. HSN’s Advanced Services team members create, design, develop, install, integrate and test of direct-to-consumer transactional systems. “Project Runway” co-host and mentor Tim Gunn is coming to QVC with a bedding and bath line this Friday. It will be offered exclusively through the home shopping network QVC until November. He is former chief creative officer at Liz Claiborne Inc., a best-selling author and an educator and former chairman of the fashion design department at the Parsons School. HSN “Mother of Invention,” as we like to call Joy Mangano, broke records again this weekend on the No. 2 home shopping network. Impressive sales from her Luxury Home Event contributed to her highest sales ever recorded in a single month while at HSN! This beats Joy’s previous record for largest anniversary month ever in September 2012 and largest month ever in July 2008. In addition, the current achievement comes on the heels of Mangano’s last record-breaker in July 2014, where she sold more than 216,000 sets of her patent-pending pillows, beating HSN’s previous record for the most units of a single item sold in a single day. What were the numbers, HSN? She also put in a plug for her Closet Shop. What the heck? The Closet Shop will feature custom Huggable Hanger closet ensembles, organization tips straight from Mangano and videos. All of the products in Joy’s Closet Shop will feature free shipping and handling and include a “buy more, save more” offer. HSN has been celebrating the 14th anniversary of Joy Mangano with Anniversary specials that continue all month long, as well as brand new products and long-time favorites that have fans jumping for Joy. We’ve been so busy at our day job, and covering the sad passing of Joan Rivers, that we hadn’t seen QVC’s “Courtney Says I Do” promotion. We know people will disagree with us, but we find it a tad tacky to be discussing every detail of your impending nuptials the way host Courtney Cason is. But then again, if the deal included getting our wedding dress designed by Mark Zunino, maybe we would change our tune. The wedding is this Saturday, by the way. And Cason’s groom-to-be is adorable. I can’t believe my wedding is just one week away. It’s weird to even type that out. It’s crazy to think that almost a year ago I wasn’t sure that I was going to be engaged anytime soon. Now it’s full on crunch time to marry the man of my dreams! As an ex-QVC host pointed out, it’s a little risky to promote a host’s wedding. What if the marriage goes sour? You may recall when then-QVC host Judy Crowell wed a fellow host, whose names escapes us now. It was a very short marriage, let’s put it that way. We’re glad Crowell finally found the man of HER dreams, fellow QVC alum Paul Deasy (now on SHopHQ). We also remember when one of our favorite bloggers wrote a lot about her coming fancy wedding to “Mr. Wonderful,” as she called him. Two years later, she was blogging about going on a date. Needless to say, all her readers were asking her what the heck was up. She sounded a bit annoyed when she explained that she and Mr. Wonderful had divorced, and would people stop asking about her personal life. Girlfriend, when you put your personal life out there, people are going to ask about it. Any way, best of luck, Courtney. Seriously, God bless. A charitable collaboration between QVC and the Fashion Footwear Association of New York (FFANY), the sale has generated more than $44 million to date. During the month of October, shoes donated by more than 80 brands will be offered at special prices to benefit breast cancer research and education. The event is scheduled to air live on QVC Oct. 16 from 6 PM to 9 PM (ET), and Trump will appear in both print and television public service announcements supporting the cause. During the three-hour event, shoppers can choose from more than 200 styles being offered at half the manufacturer’s suggested retail price. In addition, each weekday from 7 AM to 9 AM (ET) during the month of October, buyers can shop the Shoe of the Day on air, online or on the QVC apps. A minimum of 80 percent of the purchase price will benefit various breast cancer research and education institutions. Select styles from the Ivanka Trump footwear collection are scheduled to be included in the assortment. “In addition to success in both the business and fashion worlds, Ivanka’s philanthropic spirit is admirable,” QVC President and CEO Mike George said. ShopHQ jewelry vendor Sonia Bitton gave us a little scoop on Facebook today: The married silver-jewelry designing team of Richard and Marianna Jacobs are coming back to the No. 3 home shopping network. The Jacobs, whose collection of handmade jewelry is called Offerings, were originally on ShopHQ, when it was ShopNBC. Then they left and went on HSN. But they are coming back to Minnesota, according to Bitton. “OK get ready all. ‘Offerings’ will be back at SHOPHQ on October 7 at 9AM and 7PM CT and I am so excited I am the first to be announcing!! !>” Bitton wrote on Facebook. We love their jewelry, and can’t wait to see what they have cooking for ShopHQ. You are currently browsing the Homeshoppingista's Blog By Linda Moss blog archives for September, 2014.